"The purpose of business is greater than business"
Second-generation McDonald's franchisee Paul Booth, Jr., is living up to his family legacy in more ways than one. Booth, our 2018 Spirit of Franchising MVP Award winner, is a true brand ambassador. He is the face of McDonald's in every community his restaurants serve, representing the brand and his company in leadership roles on the local, regional, and national levels. The multi-faceted Cincinnati entrepreneur is also a sixth-generation minister and the founder and lead pastor of Legacy Pointe Church. "I believe that the purpose of business is greater than business," says Booth, CEO of Momentum Restaurants, which operates eight McDonald's restaurants. "That is the lens from which I lead." Booth, who worked in the family business in high school and college, follows in the footsteps of his parents, Cynthia and Paul Booth. Armed with two college degrees and corporate experience, he applied to McDonald's program for training and approving next generation franchisees. "My mom started in franchising after a 20-plus-year career in banking, where she was the highest-ranking female," says Booth. "I approached my parents to apply for the second-generation McDonald's owner-operator program--an intense program and not everyone is approved." Today, Booth honors his family and serves others every chance he gets. He is an advocate for education who aims to "touch every school" in each restaurant community through area fundraisers, student hiring, and college scholarships for employees. He also provides countless sponsorships to groups and nonprofit organizations and continues his family's active support of Cincinnati's Midwest Regional Black Family Reunion. The Booth family is a past Family of the Year honoree and founding sponsor of the annual event, which celebrates the historic strengths and values of the black family. Booth leads by example to encourage his team to lend their time and talent to help "shape and grow the communities we serve." He sits on the Forest Park Economic Development Commission, Cincinnati's Human Services Advisory Committee, and the advisory board of the hospitality management program at Cincinnati State, where he wants to help create a curriculum and program to develop future leaders in the QSR space. "We serve Big Macs, fries, and Cokes," Booth says. "But at the end of the day, this is very much about people who have a heart for service and a heart for serving others." Throughout my professional career I have held several leadership positions that have strengthened my capacity as a leader. I held an office in student government at DePauw University, earned a master's degree from Emory University, and completed several executive-level leadership development programs, including the Harvard Summer Leadership Institute and C-Change (Cincinnati Chamber of Commerce). I am also finishing up an executive Ph.D. program in business from Benedictine University. Last, my engagement in the business early on and the extensive training I have received as a second-generation McDonald's owner-operator has greatly influenced how I lead my organization today. My greatest accomplishment to date is the legacy I am building for my family through my business and the leadership posts I hold in my community. Very fast-paced! I split my time between our corporate office and the stores, meeting with mid-management and our restaurant teams who help to drive our business every day. Harvard Business Review and Outliers by Malcolm Gladwell. Build your business for where you want to go, not where you are. From my parents: What you do on the other side of your desk (community) is just as important as what you do behind your desk. From mentors: Work-life synergy is vital to your personal and professional success. People. Developing the people behind the counter is the key to delivering the experience our customers have come to expect from the McDonald's brand. Second, I am passionate about any innovation that keeps our brand relevant and engaging for future generations, such as Gen Z. If you take care of your team, they will take care of the customer. Managing the growth of our organization while keeping up with the demands of a rapidly changing marketplace and workforce. Servant leader, innovator, collaborator, visionary, and relentless. How do you hire and fire, train and retain? We are in the people business. In our hiring process we look for people who exude passion, hospitality, strong communication skills, and are high energy. From crew to management we are looking for leaders who can drive the business every day. We use these performance indicators on a scorecard to determine who are performing and who are in need of coaching or are no longer a fit for our team. In the near future, to be more intentional about our hiring practices, we will be implementing personality tests as we review management candidates. To retain, we reward and praise for performance through incentive plans, training classes, and Archways to Opportunity (McDonald's scholarship program), as well as scholarships we give to college students. We aim to retain the best talent. Develop stronger management teams to keep up with the growth of the organization. Acquire two to four more locations and continue to increase sales and transactions. Have a greater impact in the communities with key civic partners that serve our customers, such as schools, law enforcement, and faith communities. Three things: the growth of our people, same store sales and additional acquisitions, and community impact. We see ourselves not only as a business in the community, we want to be a stakeholder in the community. Every year we look for an increase in our community impact. In 5 years, 15 locations. We also want to increase our corporate and mid-management staff at headquarters to support growth. In 10 years, double our size and continue to take advantage of new opportunities. Incentive and bonus plans when they meet certain metrics and performance goals. 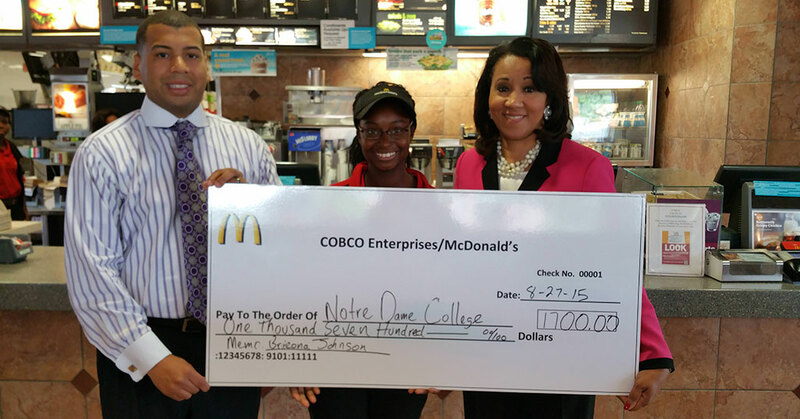 We provide college scholarships for employees from our personal organization, separate from the educational support McDonald's offers. Other educational initiatives include online high school and management courses that count for college credit. We also provide all of our employees with a meal every single day. When we look at that line on our P&L it is pretty substantial. I'm not looking for an exit strategy now. I want to continue to excel and grow the business. I think because as a Millennial business leader in franchising, I have tried to exude a focus on the triple bottom line--people, profit, and planet--and running the business from that vantage point. Second, because I'm a second-generation owner-operator, it demonstrates an influence of a legacy in this business. We have a saying in our company, "It's all about the people." You can have the greatest products in the world, but if you don't have the people to serve the customers it doesn't matter. We focus on hiring, training, and retaining the right people to provide what I call a Star Experience, which I developed. It stands for Stellar service, Timeliness, Accuracy, and Repeat visits to continue to build sales and grow transactions. We make sure we embed what it means to give the customer a Star Experience in everything we do. We are also investing and reinvesting in the business to modernize our physical plants and give our customers a new experience with technology and new product offerings as part of McDonald's Vision 2020. What innovations have you created and used to build your company? We are always trying to get better at being better. As we grow as a multi-unit franchisee, we look for ways to streamline processes and find effective ways to communicate all the key initiatives throughout our organization. We hire people and put them in the right positions to drive the business. I lead my company from a values-driven perspective. The ethos of our organization includes people first (crew and customers), integrity, and meritocracy. Integrity is everything. For us meritocracy means we want to always be a company open to hearing the voice of the people throughout the company, no matter what level they are. If someone has a good idea as a crew person to make things better, we are going to listen. Last, service. We are in the service business. We are not just a business in the community, we are a stakeholder in the community. We demonstrate this every day, not just by serving our customers, but in how we touch the communities we are located in. What leadership qualities are most important to you and your team? In addition to the core values I mentioned above, it is also about being versatile and adaptable to drive the business in an ever-changing marketplace. Positivity and optimism also help create a culture in the restaurants where people believe that anything is possible if they put their mind to it.